SPRAY.SEED users should aim for even and complete coverage of the target weed. Application of SPRAY.SEED to small actively growing weeds in 200L/ha of water with Medium to Coarse droplets is far better than using 800L/ha on large weeds where a significant proportion of the applied volume runs off and the other droplets that hit the target are too large to provide good coverage. Aim to spray small weeds. Large weeds require higher water volumes and chemical rates and are more difficult to control. SPRAY.SEED is formulated to deliver adequate adjuvant when applied at 2.4L/ha in 200L of water. 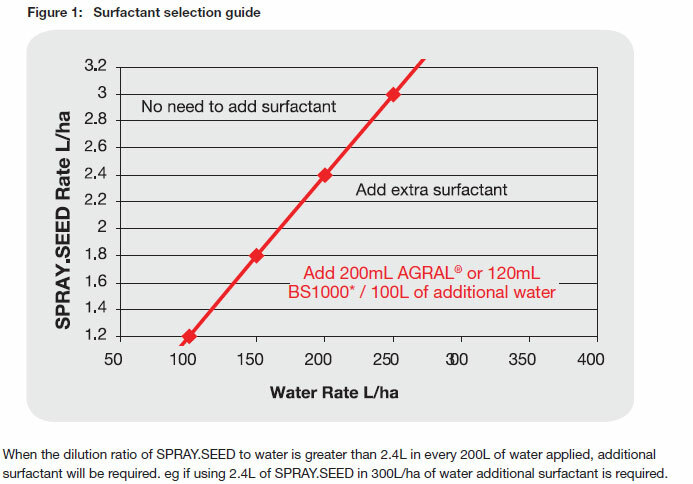 If SPRAY.SEED is applied at a more diluted concentration than 2.4L in 200L/ha of water then additional surfactant will be required to maintain efficacy (refer to Figure1). For improved control of hard-to-control weeds e.g. Wireweed, Capeweed, Marshmallow and Nettles, a Group G spike e.g. Goal* (at rates up to 250mL/ha) or Hammer* are good options. If weeds are large it is desirable to use the “double knock” technique to deliver more reliable weed control. This technique requires the application of a robust rate of glyphosate followed 1-14 days later by a robust rate of SPRAY.SEED to weeds. Avoid spraying dusty weeds or use of dirty water. SPRAY.SEED activity will be severely reduced under these conditions. If weeds are small due to moisture stress they may in fact be suffering from small tops and large roots. This gives a false impression of weed size and when lower than ideal product rates are used, weed control may be reduced. What may seem small may in fact be more advanced than meets the eye. Consider using Air Induction (AI) nozzles and increasing water volumes to ensure you are thoroughly covering the target weeds and minimising off target drift. Avoid applying SPRAY.SEED under high temperature / low humidity conditions (i.e. 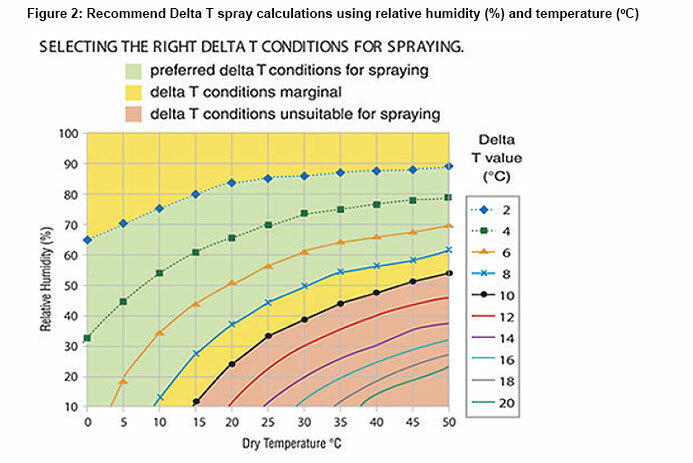 Delta T >10°C (refer to Figure 2). For more information, call us on 1800 022 035. Up to 21 days reliable rainfast protection, no matter what the weather. Follow these tips for vine health and peace of mind. Here's what some of the industry's leading advisors had to say about Miravis® under challenging trial conditions. Spoilt for data but can drones really help grape and wine production? Machine learning will soon help growers and consultants make sense of what the industry has struggled with, according to Dr Sigfredo Fuentes. Rainfast and long lasting, at least if you have to spray you can still have confidence in Voliam Targo. Some products are more user friendly than others, while others are a real headache. Pre-infection fungicides defend against downy mildew attack and must be applied as close as possible, before infection begins, to ensure new growth is well covered. THIOVIT JET is the No. 1 selling sulphur globally and in this article we spell out the 4 simple steps to ensure it is mixed properly. How Australia’s good viticulture conditions are contributing to a rise in fungicide resistance and how growers can drive the solution. One of the most talked about topics this year has been weed management. In many cases, it’s due to growing concern about herbicide resistance in the vineyard.